Situated in Baldwin County in the southwestern part of the state, Orange Beach is a popular resort city and beachfront location for the state of Alabama. It looks out onto the waters of the Gulf of Mexico and is located in close proximity to Perdido Key, one of Florida's many barrier islands. Spread out across 15.95 square miles and home to around 6,000 people, Orange Beach is a small but beautiful city that enjoys a lot of warm weather and sunshine for large parts of the year. Even the winters are mild in this southern Alabama location, making the city a great spot for people who love to spend time outdoors. The community of Orange Beach is well known for its active nature, with the city hosting a lot of different sport tournaments and games. Lots of great activities can be enjoyed in the local area like golf, dolphin watching, fishing charters, sports, wildlife spotting, kayaking, water sports, and more. The nearby Orange Beach Islands like Bird Island and Walker Island are also popular with tourists and can be reached by kayak or boat, offering even more recreation and exploration opportunities, while the beaches themselves at Orange Beach feature soft, silky, white sands and warm waters throughout the year. In short, this is a wonderful place to plan a vacation and enjoy some escapism from the noise and chaos of city life. It's also a super spot for a camping or RV trip, with lots of highly rated RV parks in the local. See below for full details on the best rated RV parks in Orange Beach, AL. Located right by the beach in a prime location for Orange Beach vacations, Buena Vista Coastal RV Resort is one of the best rated RV parks in the whole area. For a luxury, high quality RV park experience you'll never forget, this is definitely the place to be. With the biggest RV lots, the friendliest staff, the finest location, and the most extensive amenities, Buena Vista Coastal RV Resort really stands out. The RV sites at this location are all beautifully landscaped with nice garden areas and private shady spots. The RV park itself is home to a five acre fishing lake, fully stocked up with bass and bream, and also features an enormous club house for games, activities, and get together with friends, family members, and your fellow travelers. This Orange Beach RV park is literally minutes from the sea and also comes with its own huge swimming pool with a lazy river, water slide, hot tub, fitness center, a secondary indoor pool, a dog park for your canine companions, full hook-up sites, high speed Wi-Fi, and more. For the best possible experience on your next trip to Orange Beach, AL, don’t miss out on a few days and nights at Buena Vista Coastal RV Resort. Conveniently located in the heart of Orange Beach, mere minutes from some excellent restaurant and shops, Pandion Ridge RV Resort is another highly rated RV park location you won't want to miss out on. Having received many 5-star reviews from past guests, this Orange Beach RV park is a luxury destination that can put a smile on the face of every single guest, every single day. 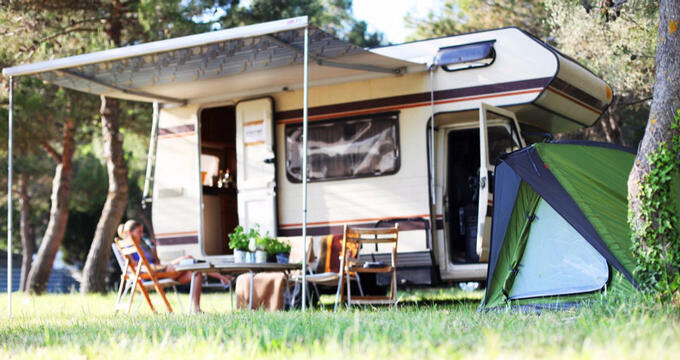 Despite its luxury facilities and classy sense of style, this RV park is fairly priced, with affordable daily and weekly rates that can suit any budget. Pandion Ridge RV Resort features over 140 spacious full hook-up sites in more than 30 acres of beautifully landscaped lands. Each site comes with private patio space, a picnic table to enjoy evening meals with your friends and family, full hook-ups, wireless internet, and more. This Orange Beach RV park is fully pet friendly and family friendly, so dogs and people of all ages are welcomed here. Some of the RV sites offer majestic lakeside views, and the on-site amenities at Pandion Ridge RV Resort include a hot tub, a 7,000 square foot clubhouse, a fitness center, laundry rooms, a pet area, garbage pick-up services, several scenic walking trails, a business center, cable TV channels, fire pits, two swimming pools, and more. Sugar Sands RV Resort is situated just north of Orange Beach in the Gulf Shores area. It's only a few minutes away from the center of Orange Beach and offers easy access to the city's beautiful stretches of white sand, while also being conveniently located for the popular fine dining locations and attractions of Gulf Shores too. A very popular Alabama RV park, Sugar Sands RV Resort features very spacious RV sites with large gardens and trees offering nice shady spots and privacy. This is a fully family friendly location that welcomes guests of all ages, and it also welcomes furry friends too, so if you plan on traveling with a dog or two then Sugar Sands RV Resort is a good place to stay in the Orange Beach area. With over 60 full hook-up sites featuring water, sewer, wireless internet, 30/50 amp power, and private picnic tables, this RV park gives you all you need to enjoy a great stay. On-site amenities at this RV park include a huge bathhouse with clean showers and toilets, a massive recreation center for games and activities, a communal indoor kitchen, lots of communal lounge space with multiple TVs, a swimming pool with sun loungers beside it, a children's play area, a volleyball court, shuffleboard court, and more. Lots of fun activities and special events are organized here too, so it's a nice RV park to choose if you like to stay active and have a chance of making some new friends.